A major problem in cancer treatment is the resistance of tumours to radiation therapy. Researchers at UC San Diego have developed a new drug for selectively sensitizing tumor cells to ionizing radiation, maximizing the effectiveness of radiation therapy while minimizing damage to healthy tissues. Imaging for this study was performed using a Nikon A1R confocal microscope. Check out the open access research article in Nature Communications to learn more. Researchers from the Weizmann Institute of Science have published a new method in the journal Optica for glare reduction. Glare happens when non-specific light obscures the object one is trying to look at. This new method uses a spatial light modulator to optimize a pattern for glare removal – drastically reducing background signal. In biological microscopy, this method is promising for imaging through thick and scattering structures, such as tissue. Check out the Phys.org article to learn more. Researchers from the Broad Institute of MIT and Harvard have published a new protocol in Nature Protocols detailing Cell Painting – a high content screening assay for evaluating about 1500 morphological features of single cells, including shape, texture, size, etc. 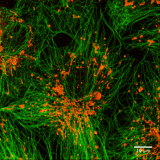 Simple 6-color staining allows researchers to include organelle morphology in analysis, including the nucleus, mitochondria, and actin cytoskeleton. This protocol provides a powerful method for evaluating the effects of different chemicals on cells, including potential treatments for cancer. The CellProfiler analysis software is open source, so check it out! Congratulations to Japanese biologist Yoshinori Ohsumi of the Tokyo Institute of Technology for winning the 2016 Nobel Prize in Physiology or Medicine. Professor Ohsumi was awarded the Prize for his research in autophagy – a process whereby intracellular components are delivered to the lysosome for degradation and subsequent recycling. To learn more, check out the NPR article. Recently published research in the journal Scientific Reports presents the first evidence of deep-sea organisms ingesting microplastics. Squat lobsters, sea cucumbers, and hermit crabs from the mid-Atlantic and southwest Indian Oceans were found to contain microbeads – small plastics commonly used in commercial cleaners and cosmetics. Different types of plastics were identified using a Nikon polarizing light microscope. Check out the Phys.org article to learn more. We are proud to announce the winner of the Nikon Single Molecule Imaging Contest held during the 6th annual Single Molecule Localization Microscopy Symposium (SMLMS) at Ecole polytechnique fédérale de Lausanne (EPFL). Check out the first prize winning image here – a two color STORM image of fixed COS-7 cells stained for microtubules (green, Alexa 647 – alpha-tubulin) and mitochondria (red, Alexa 750 – TOMM-20). The winners will receive a Nikon D5500 digital SLR camera – congratulations! Researchers working as part of the Stem Cell Evaluation Technology Research Center have introduced a non-invasive and image-based method for evaluating the quality of live human pluripotent stem cell (hPSC) colonies over time. This method relies upon multiparametric analyses of cell morphology as detected using phase contrast optics, and was in agreement with gene expression profile data. Imaging was performed using a robotic Nikon BioStation CT incubation/microscope system. The Scientific Reports article is open access, so check it out! Here’s an interesting article by NPR about how computer scientists at the University of Kentucky were able to read a scroll that was radiocarbon-dated to the 3rd-4th century CE. The catch? The age and damage to the scroll prevented it from being opened, so instead the researchers used non-invasive x-ray micro-computed tomography (microCT) to create a 3D image of the scroll from which they could reconstruct the text. Co-author Seth Parker hopes the method will be applied to other ancient texts, including those recovered from Pompeii and Herculaneum. Hurry as spots are filling quickly! Black holes are typically perceived as vast and mysterious, but is it possible that microscopic black holes exist? Outer Places thinks so. We are excited to announce our newest imaging solution – the DS-Fi3 color camera and accompanying DS-L4 tablet controller. Excitingly, the DS-Fi3 communicates directly with the DS-L4 tablet, eliminating the need for a computer workstation. Images can be acquired using the tablet and shared directly over a Wi-Fi network or shared network drive. We hope this new duo will provide a versatile and user-friendly solution for imaging in today’s fast-paced mobile environment. Researchers have developed a new type of hydrogel for growing stem cells and differentiating them into neurons. These amyloid hydrogels are based on the alpha-synuclein protein, and provide an excellent vehicle for cell replacement therapies, useful for treating neurodegenerative diseases such as Parkinson’s. Cell and gel imaging was performed using a Nikon Eclipse Ti-U inverted research microscope. To learn more, check out the open access article. The 6th annual Single Molecule Localization Microscopy Symposium (SMLMS) at Ecole polytechnique fédérale de Lausanne (EPFL) has concluded. We are proud to sponsor such an amazing symposium focused on bringing researchers in the field of single molecule super-resolution imaging together. Part of the SMLMS is the software challenge – where researchers compare algorithms and software packages for analyzing STORM-type single molecule datasets acquired under a variety of different conditions. Check out the video on the SMLMS YouTube Channel to see the results! One of the greatest problems in microscopy is resolving two closely spaced objects as separate, with the minimum distance previously thought to be fundamentally-limited by the diffraction of light. However, new research from the National University of Singapore utilizes modern advances in quantum-information theory to extract even more information from detected light. This new optical method – spatial-mode demultiplexing (SPADE) – also utilizes a specialized multichannel detector for separating the detected light by mode, capable of super-resolution. Researchers at Emory University University have characterized the organization of the desmosome using direct stochastic optical reconstruction microscopy (dSTORM). Desomosomes are macromolecular junctions providing cell-cell adhesion. Using multicolor dSTORM, the organization of desmoglein 3, plakoglobin, and desmoplakin was quantified in keratinocytes. dSTORM successfully resolved the separation between the inner and outer dense plaque proteins. Imaging was performed using a Nikon N-STORM microscope, with correlative imaging performed using the Nikon N-SIM E structured illumination system on the same stand. 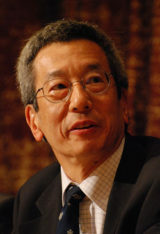 Dr. Tsien was a Professor in the Departments of Pharmacology and Chemistry and Biochemistry at the University of California, San Diego. He is perhaps best known for discovering and developing green fluorescent protein (GFP) as a genetically expressed biochemical marker for use in living systems, which lead to a revolution in biological imaging. We’re constantly amazed at the continuing advances in microscopy. Research at Penn State and Lawrence Berkeley National Lab is pushing the resolving ability of electron microscopy to the tens of picometers – more than enough to see a single hydrogen atom. Such high power microscopes are a crucial tool for designing and building new materials, including specialized semiconductors, superconductors, and more. Check out the article to learn more. Here’s a great article about a collaborative research team from Florida State University, Johns Hopkins University, and National Institutes of Health (NIH) that has identified two different groups of drugs for the treatment of Zika. One group of drugs prevents the virus from replicating in humans and the other protects developing brain cells in newborns. The researchers hope that by using existing drugs they’ll be able to address this global health emergency without waiting years for new drugs to emerge from the development pipeline. The targeting of vesicles to the right target membrane is an early and important step in intracellular transport. New research has found that EEA1, a tethering protein that localizes to early endosomes, undergoes a conformational change from an extended form to a collapsed form upon interaction with Rab5:GTP. The change to the collapsed form provides force to pull the vesicle to the target membrane for docking and fusion. Confocal imaging was performed using a Nikon Ti-E inverted microscope with a Yokogawa CSU-X1 spinning disk, and super-resolution imaging with a Nikon N-STORM microscope.